Hand quilting has never gone out of style. It's not only a functional way of finishing your quilts but decorative, too. Learn all the essentials of hand quilting in this class, including hand quilting stitches. You'll also learn about the different types of frames, batting, needles and threads used in hand quilting. This class does not teach you to piece anything, only to do the quilting stitches that hold the three layers of a quilt together. Kit included. Taught by Sheila Blair. Limited to 6 students. We're often asked "What are the best needles for hand quilting?" 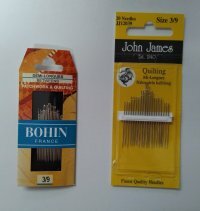 While Sheila provides many tools and notions for students to try in this class, these needles are her personal favorites: Bohin Betweens, Assorted Sizes (00368BE), and John James Quilting, Size 3/9 (JJ12039).